After spending 40 years and unspeakable amounts of investor money to make his dream a reality, Paul Moller’s flying car is finally available for purchase. But because flying cars are perpetually “just two years away,” Moller is actually auctioning off his original prototype, not a production model. 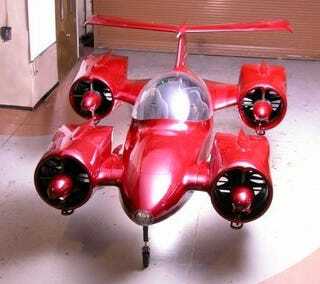 You’ve probably seen the G90 M400 Skycar before. As our own Matt Novak has pointed out, Moller has convinced countless publications to feature his creation over the years, promising a future where bumper-to-bumper traffic is a thing of the past—a dream that has always been just over the horizon. After a failed Indiegogo campaign, however, and a run-in with the SEC back in 2003, it seems like Moller is now turning to eBay to help fund the development of his flying car (at least for the next two years). If you want to bid on the 2001 G90 M400 Skycar, which in the past has been demonstrated to actually take off and fly, you’ll need to meet the $1,000,000 (£772,000) reserve. If you’re worried about being outbid, you can also buy the Moller Skycar outright for $5,000,000 (£3,860,000) which is still a steal given it’s estimated to have cost over $150 million (£115.8 million) to develop the vehicle. However, this isn’t the first time Moller has tried to sell his prototype on eBay. Back in 2006 the vehicle went up for auction as well, but the reserve was never met. Maybe there isn’t really a demand for flying cars yet? Or at least ones you can’t actually fly, because—as Moller’s eBay listing points out—the FAA won’t let you fly the Moller Skycar without significant repairs and reassembly. A collector who buys the M400 will receive it in its original 2001 flight form and condition, complete with eight Rotapower engines that produced over 720 hp allowing the M400 Skycar® to take off and land vertically. It should be noted, however, in this original form, it does not have FAA approval and a condition of this offer is that it cannot be flown. Nonetheless, this vehicle can be the centerpiece of any car or aircraft collection in a public or private museum. Reassembling the M400 back to its original state will take some time.